1. First of all, never ever wear your pearl jewelry prior to applying makeup or fragrances. It is actually true for all types of ornaments. The chemical compounds present in makeup items or perfumes can damage the color as well as the structure of the jewelry. So, always wear your makeup and perfume first. 2. If there is any particular item of pearl that you need to wear for long time, make sure that you remove it each time before taking a bath. Pearls can get affected by excessive water. Besides, the soaps, shampoos and other products that we use during bath time can also react with the natural gems. 3. Do not apply and skin care product while wearing your pearl jewelry. Moisturizer, body lotion, and other similar products contain a lot of chemicals that are enough to make your bangles, rings, anklets, etc. look dim yellow. 4. 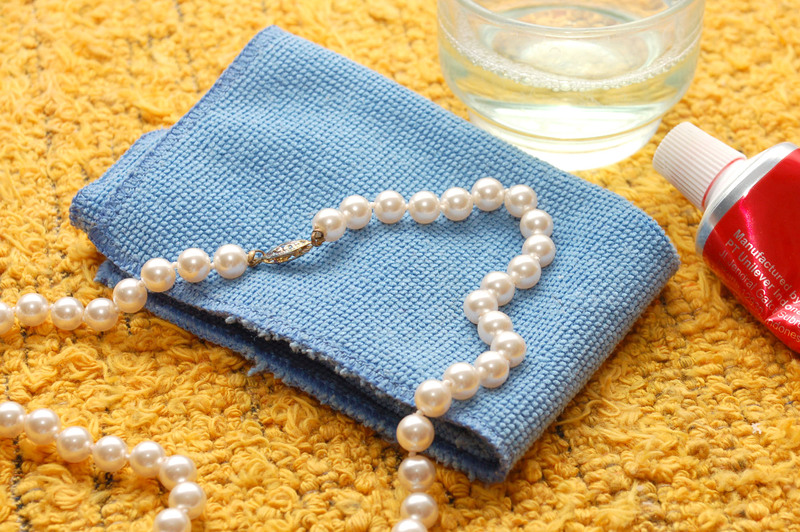 While cleaning off your pearl jewelry, keep a piece of thin soft cloth handy. A silk or muslin is always the best choice. Using something thick and rough can be harsh for the pearls and you might end up scratching its nacre coating. 5. Be as gentle as possible while cleaning your dull or dirty pearl ornaments. It is recommended that you grab the cloth with three of your fingers and wipe the pearls softly instead of rubbing them. 6. Sometime a simple wiping cannot take out the dirt from the surfaces of the gems. In such situations, damp the cloth in plain water a little and use it for cleaning purpose. You need to be very careful at this step as making the cloth too much wet may loosen the pearls from the base and damage the entire piece of jewelry. 7. Many of us simply pack off pearl jewelry right after cleaning them with a damp cloth. It is absolutely a wrong process. There must be a gap of at least 10 minutes, called ‘breathing time’, between cleaning and packing. During this period, keep the ornaments under the fan and let them dry completely. It is very important for maintaining the quality and beauty of pearls. 8. Stuffing all pearl ornaments in a small cramped box is a strict ‘no-no’. If each of them is not provided with enough room, the settings will get damaged and the gems will easily get detached from the base. 9. Keep and store your pearl jewelry separately. It is essential for their proper maintenance. If you store them with other ornaments, the shine of the pearl coating will get reduced due to friction. Moreover, if there is any item with pointed borders, the chance is big that the coating will get scratched out. 10. Finally, if you love to wear pearl necklace and want to put one on for a long period, make sure that you know when to replace its string. Whatever the material is used for making the thread, it will become weak after a certain time. Be aware of the fact and get ready before the pearls fall out.